Sarah Palin gave a couple speeches this weekend - one for the Cal State University Stanislaus Foundation and one during Freedom Fest in Norfolk, Virginia. I thought there were a couple things interesting about the two speeches and thought I would lump them together. First, in the Stanislaus speech, Palin attacked her critics, in particular the dumpster diving students who revealed parts of her contract and State Attorney General Jerry Brown, who is investigating into whether or not the campus foundation violated public disclosure laws. Regarding the dumpster divers, one particular thing came to mind - the dumpster diving activities of failed Republican state assemblyman candidate Derrick Roach, who decided to dig through an ACORN dumpster one night discovering plenty of documents containing sensitive information. According to Roach, he just happened to stumble upon ACORN employees throwing away documents and so he decided to take a closer look. Roach's story even appeared on Andrew Breitbart's Big Government as "breaking," claiming the sensitive documents were dumped in a public dumpster. Unfortunately, Roach's accounts were false. The dumpster was not "public," and was actually behind a tall fence. Those little details called facts didn't matter since the story involved ACORN, the organization conservatives liked to vilify - Palin made numerous mention of the group and Obama while on the campaign trail. I'm sure Palin had no problem with that guy digging through another's trash. Sarah Palin also attacked Jerry Brown over trying to figure out how much she got paid for her speech, asking if the Attorney General had anything better to do with his time, but Palin seems to be unfamiliar with the focus of Brown's investigation - whether or not the organization hosting Palin's speech violated state disclosure laws. Everyone knows Palin hates disclosing anything to the public, hence her private email accounts when she was the half-term governor of Alaska. Brown has everyright to investigate the funding of her speech, besides, it is not the issue of how much she got paid but if the school was required to tell taxpayers how much of their money they spent. I also thought it was interesting that there were three times as many Palin protesters as there were supporters. Considering the coverage of Tea Party events by Palin's employers over at Fox News, who over-inflate protest numbers to make their marches look bigger then what they really are (to try and give the impression that they are the majority), one could look at the facts here and come to the conclusion that at most, those supporting Palin's message represent roughly 23% of the population (based off of 30 supporters out of an average total of 130 people). Now considering Palin's speech in Virginia, I thought she made an interesting comment regarding budget cuts. Palin told the veteran-heavy crowd that the president had cut military spending and that is a big no-no. 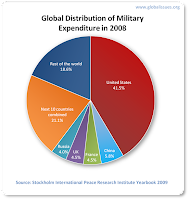 According to Palin, the military's budget should never be touched. 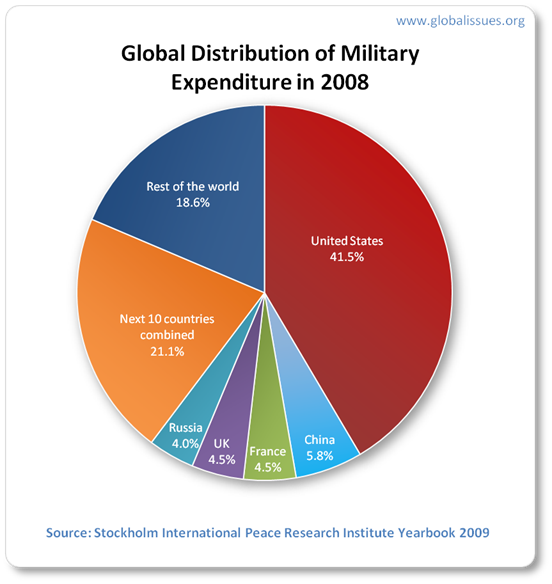 Considering the military represents the government's largest expenditure and that America still spends more then the next top nations combined, I think it is safe to say that the American military budget is a little much.